Wedding announcements are a great way to keep people together and informed without boundaries. The internet gives us the resources to keep yourself or your cause connected the masses. 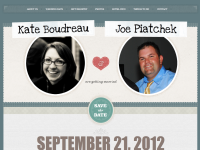 Joe and Kate came to Web Design Logics because they were looking for an innovative way to keep family and friends update to date and informed on details surrounding their upcoming wedding. We decided to create a one page website that gave important venue information to guess visiting the area as well as details about hotels, thing to do, and places to eat. Also included was a contact form so visitors could communicate with Joe and Kate in an easy and friendly manner. Web Design Logics used a simple HTML template design selected by Joe and Kate that was customized to for their needs. Working together with these newlyweds was a blast and our team was excited to be a part of their special day. Thank you Joe and Kate P. for your trust in delivering your vision to your family and friends. We wish you luck in your future together.